Tonight is a Marvel Legends 6 kind of night. 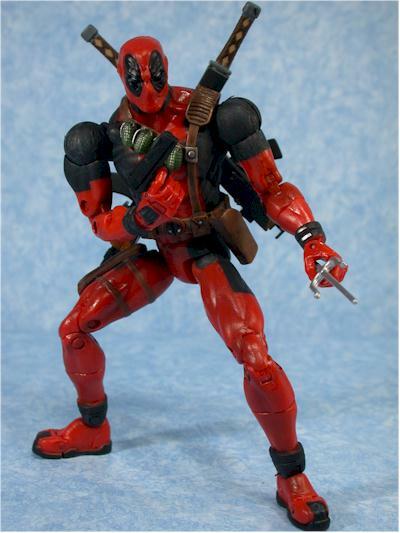 Coheteboy has his guest review of the brown costume Wolverine up, and I have my review of Deadpool. Other figures in the series include Juggernaut, Phoenix and a Thomas Jane Punisher. Toybiz continues to please the Marvel fanbase with great sculpts, excellent articulation, and lots of accessories, all for a reasonable price. This is wave 6 for the series, and the boxed sets continue to hit as well. You should be seeing both the Sinister Six boxed set and the Fantastic Four boxed set at your local stores right now. Retail for the figures continues to stay low, around $7 - $8 depending on the retailer. That's about the best value in the action figure market right now. Oh, and Deadpool? Well, I've always been a fan of the sometimes good guy, sometimes bad guy, complex character. 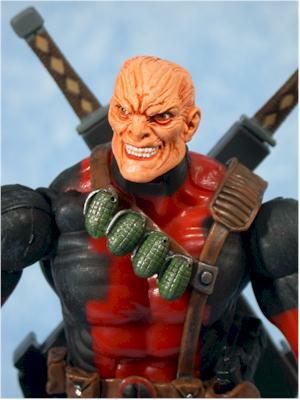 Deadpool is a mercenary, a man who was dying of cancer and found a cure that also gave him superhuman healing powers - and some truly bad skin. He hasn't been around for long, introduced back in 1991 in issue number 98 of the New Mutants, but he's been a popular character with most fans. 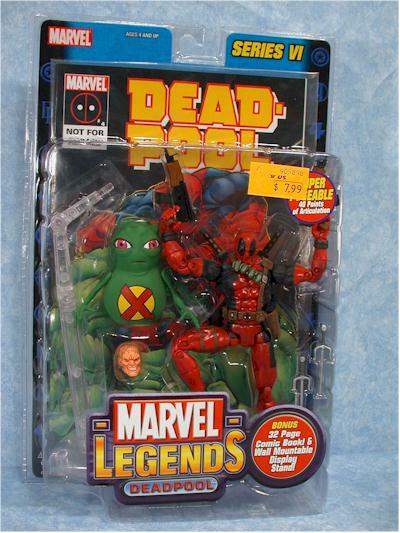 Toybiz has gone with clamshells for Marvel Legends, and you know I think that's an excellent choice. They have very little shelf wear, they show off the entire figure and accessories, and still allow for a colorful and text filled insert backer. The backers for the ML stuff isn't quite as exciting or interesting as say the work by Mcfarlane, NECA or Palisades with their clamshells, but it works fine for the mass market audience. This sculpt continues the fine tradition of the ML figures, blending great looks with great articulation. Now, there are some folks that hate these figures because they despise all the joints and feel they detract from the appearance. If you're one of those folks, your score here will be much lower. But for me, this is a great figure. Nice detailed sculpting, particularly on both faces and the musculature, and yet they manage to get in 40 some odd points of articulation. 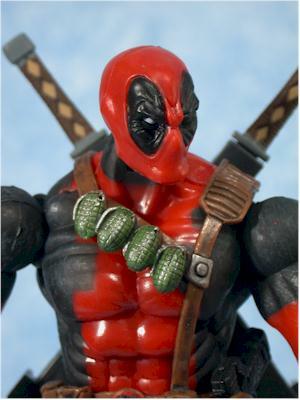 There's also plenty of detail work on the permanently attached items, like his belt or the grenades. Some of the joints do hurt the sculpt slightly, and that's why he's not a four star. The wonky shoulder joints work great, but don't look as good, and the overall proportions seem a bit off at certain angles. 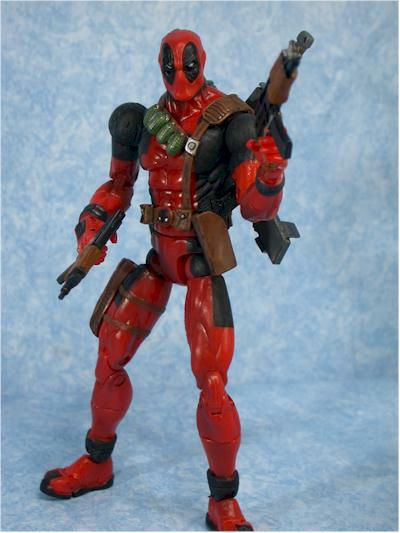 Still, this is certainly the best version of Deadpool we've ever been treated to by Toybiz. 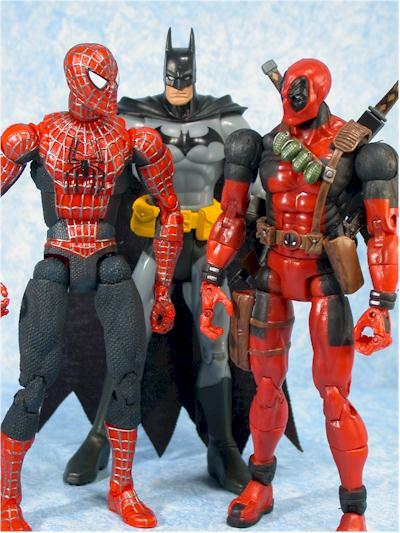 It's always worth noting scale, and Deadpool's size fits in nicely with the rest of the ML line, as well as the Spider-man line. He even fits in pretty well with the Mattel Batman line, so you'll have no trouble pitting him against the other super heroes on your shelf. Most of the paint ops are black and red, covering his spiffy costume. The edges on some of the black are a tad fuzzy, and it looks like the masking wasn't quite perfect. But the detail work on both faces, particularly the unmasked version is fantastic. There is also a rather unusual contrast between the black and red of his outfit. The red is bright, shiny and very consistent, since that's the color the plastic was cast in. The black is a matte finish, and is 'weathered' a bit, clearly on purpose. I'm not quite sure if I like this contrast or not, but it's worth noting. If you think articulation is cocaine, than this figure is crack. Deadpool has a ball joint at the top of the neck where the heads pop on, another neck joint at the torso so the head can move forward and back, ball jointed shoulders that are attached to these nifty 'posts' that slide in and out of the cest cavity, allowing the arms to have a tremendous range of motion, ball jointed hips, double jointed elbows and knees, wrists and ankles, cut forearms and calves, and even half foot and fingers! Then there's the chest joints and the waist...and I'm forgetting something, I'm sure. The joints on mine were all fairly tight as well, allowing him to hold most of the positions I put him in without trouble, and allowing him to stand fine on his own. Here's another category in which this figure truly excels. He has tons of extra goodies, all useful and cool. First, there's his weapons arsenal, key for this particular character. There's two macine guns, two sais, two swords, and a handgun. 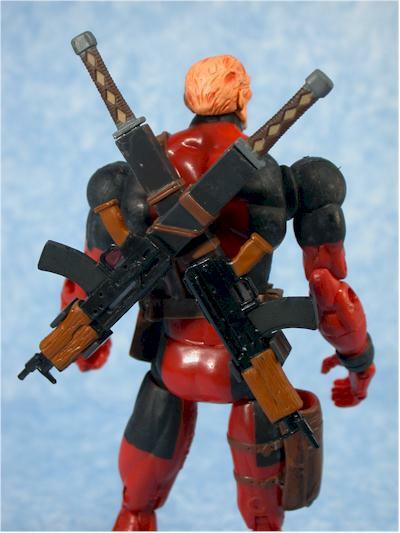 The swords and larger guns fit in and on the scabbards across his back, while the handgun fits nicely in a holster on his right hip. There is also a bag/holster on his left hip, but I'm not sure what this is for. You'd assume the sais, but they don't really fit. It's a mystery for the ages. 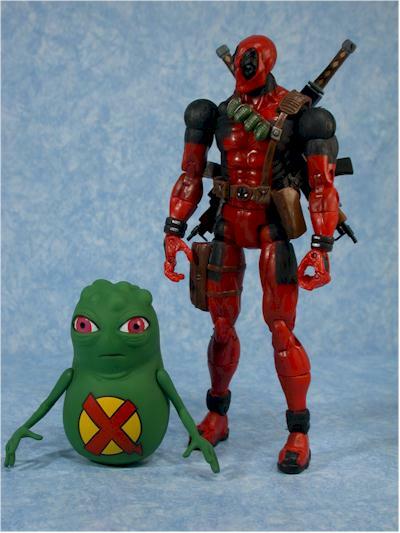 Then there's the extra goodies - the comic book, the wall mountable display stand, the additional head, and Doop. Now, don't go asking me any detailed questions about who the hell Doop is, because I have no idea. I'm not a reader of the X-men/X-force etc. books, but I do know this little green guy and Wolverine have some sort of past together. He's got articulated arms, and is pretty much a green blob. Hey, the sculpt and paint are nice if you know who he is, but like Howard the Duck packed with Silver Surfer, Doop has little actually do with Deadpool. The alternate head, with his nasty skin, is fantastic, and both heads pop on and off easy enough. While all the weapons and goodies are nice, the extra head is always the best. The display stand is worth mentioning as well. 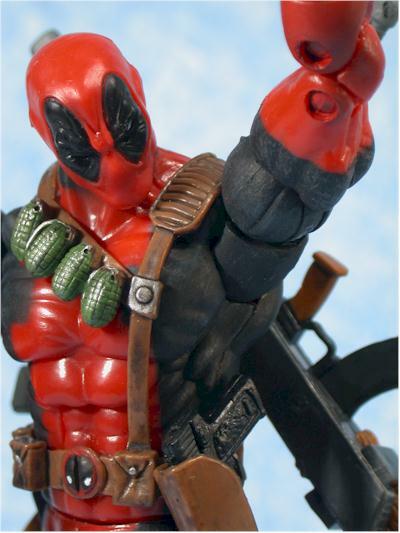 It is a long, clear pole with several joints and a base that attaches to a hole in Deadpool's lower back. It can be attached to a wall, and you can put him in various jumping or fighting poses, apparently suspended in air. Got kids that love Marvel characters? Get them some Marvel Legends. This is a great line that appeals to both kids and adults, with tons of play value and lots of posing. At just $7 to $8 each, depending on the retailer, these are some of the very best values on the market right now. It should be no surprise that one of the other excellent values, Lord of the Rings, is also from Toybiz. While other companies have a tough time getting on the pegs at large retailers, they seem to have a nice little chunk of real estate carved out for themselves. This is a terrific figure, with all the bells and whistles. Great sculpting, fantastic articulation, and a wide variety of sensible accessories, all at a great price. If every line was this good, we'd be in collector heaven. Now, the articulation DOES take away from the sculpt to some degree. Clearly the Marvel Legends figures are intended for the articulation junkie, or the collector who really loves toys, not statues. These things put the 'action' in action figure, but that's not for everyone. I had a few minor issues here that kept the figure from a full four stars - the sais and swords don't fit all that well in the articulated hands, the shoulders do stick out a tad too much, and I still haven't figured out just what I should do with the holster on his right thigh - but overall this is a great figure. EDITOR'S NOTE - reader Onslaught just pointed out that the body was a reused Daredevil, and Toybiz didn't remove the bag for his chuk's. I suppose you could cut a hole in the bottom and get the sais to fit, but that's pretty silly on Toybiz's part. Then again, you know they have to cut corners someplace to maintain such a low price point. If there's anything negative about the overall Marvel Legends line, it's the damn chase figures. This time around, there's a repainted cable and a Dark Phoenix figure that are only in a limited number of cases. On top of that, the regular Phoenix and this Deadpool are only one each per case, while the complete waste of plastic that is the Thomas Jane Punisher is heavy packed. These kind of case assortments drive collectors nuts, and while the true chase figures make retailers happy, the discourage both kids and collectors. - CornerStoreComics sells individual figures from this (and other waves) for $10 each. - Alter Ego Comics has cases for sale at $105 each. - Southern Island has the set of 4 non-short packs for $30 or each of the four for $9 individually. 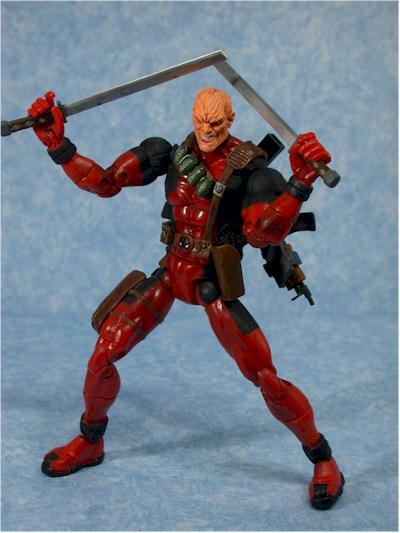 - Qwiksand Collectibles has a variety of the Marvel Legends stuff available in different deals.